What Arm Positions do you see in Strongman? Structural balance is the concept, which I first learnt from Charles Poliquin, to improve performance and also to minimize and fix injuries. 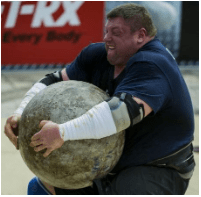 By seeing the predominant arm position in the sport of Strongman, you can see where you might want to focus some of your training efforts. Predominantly, you see a position where the upper arm is beside the torso, or in front, with a semi-supinated (Neutral) grip. This position will recruit the Brachialis muscle mostly, which sits below the Biceps Brachii. Effectively then, this is a movement pattern or position that Strongmen are highly exposed to. Adding in more volume of things such as Hammer Grip Curls would only be warranted if there already exists a weakness. If you add in additional work all you might be doing is exacerbating a problem. Target the weak and under-exposed movement pattern with Incline Curls and utilise a supinated (Palms Up) grip. This will target the Biceps Brachii and specifically the Long Head which I’ve found to be under-developed in Strongmen due to lack of exposure. Balancing out this movement will lead to less occurrence of shoulder impingement. This is due to a better balance between muscle groups and also the fact that the long head of the biceps acts as a shoulder stabiliser. The long head of the biceps is also the last muscle to fire in the overhead press. This is a safety mechanism to safeguard the shoulder again. The principle is you can only accelerate as fast as you can decelerate. Your shoulders and triceps can only press as quickly as the decelerators can handle. Consider also a larger arm means in overhead pressing you will have a compression where the biceps push into the forearm. This means less compressive forces at the elbow joint resulting in lower chance of injury, and also a slingshot-like mechanism due to the increased surface contact between the muscle groups. Only Biceps Movements included to be completed at the end of your Upper Body workout but can be paired with Shoulders, Triceps, Chest, Shoulder Stabilizers. Do you need to train them all the time? No, not at all. Adding them in during the off-season or at the end of upper body sessions is a great way to maintain balance. You are only as strong as your weakest link and maybe the Long Head of the Biceps, or lack thereof, is holding you back? Tom owns a private strength & conditioning facility in the UK (Winning Health Solutions) & a Strength Coach/Personal Trainer Education company (Winning Performance). He is also a 3 x national Strongman Champion at u90kg. Not only has he proved himself in the sport, but that of his clients as well. He can take a strongman from novice to the international stage, like with Aaron Page. He has taken other seasoned strongmen from obscurity to the same level, like Lee Forbister. With this success he has started to be sought out by many other competitors.